I can't believe that Christmas is less than 1 week away! The older I get, the faster time seems to fly by. It seems like just yesterday my sophomore in high school was just a baby! I wish I could just freeze time! Today I'll be sharing my husband's home office. Trust me when I say that it doesn't normally look this way. He works from home so you can only imagine. I took the opportunity one day that he was out of town to straighten up a bit! The room is paneled in pine. Then we had a faux artist come in and heavily distress it all. It is definitely a favorite room in the house. It is still a work in progress in that window treatments and art work are still needed. I really changed up the mantle this year. I have only been blogging a few months so you haven't seen it in previous years. It is much quieter this year with the burlap ribbon and golden balls. The wooden beams really add to the warmth. The garland is faux, but the swag above the oil is fresh cedar from our woods. My hubby collects mortar and pestles. He has quite an extensive collection. I borrowed a few from the bookcase and some old books. I simply filled them with an assortment of golden balls. I found these carved wood and iron reindeer a few years ago at Pier One Imports. I really like how they blend in with the wood. The golfing Santa was purchased over 10 years ago during my burgundy phase in Christmas decorating. It is just so pretty and means a lot in that my son and hubby are avid golfers. My son is on the high school golf team. These book cases are used quite frequently! They really need to be reworked again. My daughter and I removed everything about 2 years ago to freshen it up. It looks like it is time to do that again. Hmmm….future post! I bought the wing back chairs right before we moved in here from an ad in the paper. They are great chairs, but were bright canary yellow! I got them both for $125!!! We upholstered in 2 different fabrics to give that put together over time look. Still happy with them 8 years later! Thanks so much for stopping by today! I'd love for you to follow my blogging journey. Ways to follow are on the sidebar. Merry Christmas!! Linking Up at these fabulous blogs! I love this paneled room. Great equestrian painting and love the tiles around the fireplace. Beautiful traditional room. Kim, thanks so much!!!! Such sweet comments. It means so much. Happy New Year! Gorgeous room! I will feature this tomorrow at Home Sweet Home! Sherry, thank you so much!!! So excited! Love your blog and party! What an honor! Diane, what kind words! I hope you had a Merry Christmas and will stop back by soon! Happy New Year! A truly beautiful room, and the Christmas decor just makes it even more lovely! Thank you for sharing it. A very merry Christmas to you and your family! Richella, thank you so very much! Your feature at SH is just beautiful! Merry Christmas! Wow, Australia! Thanks you so much, Pernilla! Happy Holiday to you as well. Thanks so much for stopping by! The room is absolutely stunning! And decked out for Christmas.. it’s extra gorgeous!! Thanks so much for sharing this beautiful room. Merry, merry Christmas. Thanks, Shannon. I really enjoy the pinning party. Going to take a couch break and check out the new pins since last night! Merry Christmas, sweet lady! Your husband’s office is elegant and gorgeous. I can see why it’s one of your favorite rooms. Love the pine paneling and the tiles around the fire place. Of course, you decorated it beautifully. Just the right amount of decoration. I’ll bet your husband loved the decorations. Thanks, Babs! My hubby says the only thing missing from the pics is him sitting at his desk! LOL!! Merry Christmas! Love the elegance and simplicity of your Christmas decor! So inviting! Jana, how sweet. Thanks so very much. Merry CHristmas to you and your family! Christy, I love your study! So beautiful! Thanks so much, Angie! Wave a beautiful CHristmas with your family! Oh my goodness! Your study is beautiful! Like in a dream. Great decor too by the way. I’d love to have you link this us to Titus 2 Tuesday this week on Cornerstone Confessions.. I hope to see you there. Thanks so much, Kathy! I’ll check it out! Merry Christmas! Wow! That is one gorgeous room! Love the ceiling and all the decor! Shelley, you are so sweet. Thanks so much and Merry Christmas! This room looks fantastic, and I love the hunt scene picture above the fireplace! You did a great job with the decor by bringing in Christmas items, but at the same time keeping it masculine. Thanks, Karen! I am so happy you stopped by! Merry Christmas! Well Christy it has been decided upon that my family and I will be moving in after the holidays! ;) Your home is amazingly beautiful. Pamela, you are so sweet! Come on girl….just bring that beautiful hutch in your dining room! Merry Christmas! An absolute gem, Christy! So lovely and warm. Thanks, sweet Linda. I hope you have a lovely Christmas! What a beautiful room and I love your decorations with a mix of what was already in the room and the Christmas items. You did a great job! That’s the way I try to decorate too, a little of what is normally there and a bit of seasonal from my stash. Hope you’ll stop by and visit my blog to see our home during Christmas. Laura, Thanks for visiting! Thanks for the wonderful compliments. I will visit your blog! Merry Christmas! Love the feeling of a mans Christmas in these snaps!! This room is good enough for any of the ‘high fashion decor’ mags!! The bookcase, I think ‘lived in ‘…is fab!! Bravo Christy, u have the touch. Gosh, you made me smile! Thanks for the sweet compliments! Merry Christmas and thanks for stopping by! Just gorgeous! So warm and inviting in every way. Merry Christmas to you and your family. Thanks so much Debbie! Merry Christmas to you all as well! Christy, the study is so beautifully decorated and warm. 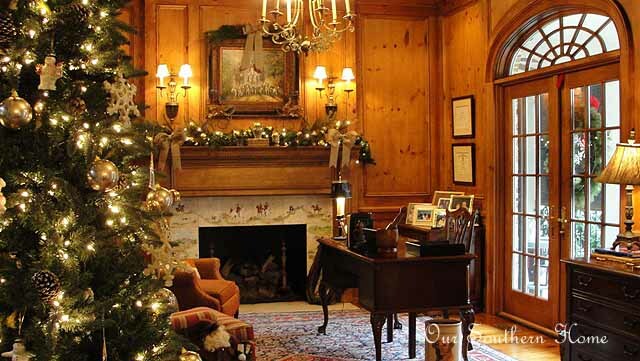 Love the wood and iron reindeer; and the fireplace surround is gorgeous. What a lovely room! Thanks bunches, Shenita! Merry Christmas!